Dal Lake was completely frozen in 1965 when a Jeep crossed the frozen surface from one end to another end. 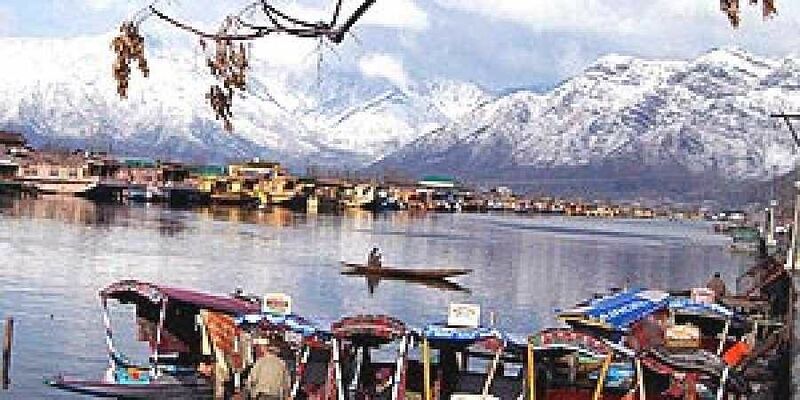 SRINAGAR: The world famous Dal Lake was partially frozen, particularly near the banks on Friday, as the summer capital, Srinagar recorded the coldest night of the winter so far after the mercury dipped and settled at minus 4 degree. Water taps and other water bodies, including nallahs and drains, were partially frozen in the city. Dal Lake, particularly near the banks, was also frozen as people woke up this morning when the Shikarawalas were facing difficulty to move through the frozen parts of the waterbody. People near banks could be seen throwing stones and paper on the frozen parts of the lake. However, as the day progressed, the frozen water again melted after sun came out, resulting in some improvement in the day temperature though ice cold winds continued. 6 degree recorded on Thursday, the night temperature in Srinagar was minus 4 degree, which is about 3 degree below normal. It was again frozen in 1986, when people played ice hockey and cricket besides taking photographs on the frozen surface. People in some areas, particularly in the outskirts and Lake area, complained of water shortage as the tapes had frozen. People were seen trying to defreeze frozen taps by burning wood in the morning. Meanwhile, doctors have warned elderly persons and children, not to venture out of their homes in the morning and evening when temperature dips to below freezing point. Doctors have also advised people having heart, chest and bone problems to avoid going out when the mercury is sub zero. Shops selling “Harisa” (prepared by meat during winter only) witness rush of customers despite chilly weather.